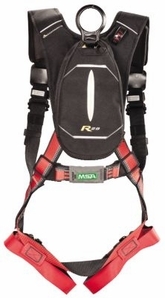 The MSA Latchways 10176309 Personal Rescue Device (Model 10176310 for size X-Large) is a lightweight, unobtrusive personal rescue device that is an integrated full body harness system for self-rescue that includes MSA's Evotech Lite Full Body Harness. In the event of a fall the self rescue device lowers the worker or employee to the ground in a controlled descent. ● Available Sizes: Standard (10176309), X-Large 10176310.